Having used both the original BarreAmped DVD and BarreAmped Cardio Burn, I have a lot of respect for both barre and Suzanne Bowen, so when I saw that she had fused barre with rebounding, I was so excited to give it a try! Especially since I'd gotten a rebounder for Christmas. I was expecting lots of jumping, a high heart rate, and sore muscles. But did I get it? BarreAmped, with a trampoline. This DVD is a mixture of classic barre moves like rear leg raises and see-saws, with added cardio intervals on the trampoline, which also serves to provide an unstable surface to perform moves upon, adding a new challenge to relevé. As with all BarreAmped, you will want light - and I mean light - hand weights. I'm used to 2.5-4kg (5-9lbs), but when BarreAmped comes into things, I can't manage more than 1.5kg (3lbs), and most often use 1kg (2lbs). I also often underestimate it when I've not done it in a while and start with 1.5kg, then realise after 4 reps that I've made a terrible mistake. It's the same with Pilates. It looks easy. It isn't. But it's worth it, and it's a form of exercise that everyone will feel. You also need a trampoline or rebounder - as if that much wasn't already obvious. A personal trampoline about 42 inches across, with a handle. The thing is, this DVD was made in conjunction with Jump Sport's trampoline, which means that the movements used in this DVD - including pull-ups - are safe to use with the trampoline. This means that using anything other than the advertised trampoline could be difficult. If you have a sport trampoline, you're probably fine, but something picked up on the cheap probably won't do. Given the nature of trampolines, especially fold-away ones, and the variety of moves done in this workout, you want to make sure that the trampoline you have can handle the job. I've been using Upper Bounce, which I was given for Christmas, and, if I'm honest, I'm not at all happy using the handle for pull-ups. It's held out well enough, but every time I used it, I worried about it. Advanced modifications are provided for both bouncing and barre, but in truth, ruling the difficulty of the DVD itself is a challenge. The bouncing is easy - children can do it. But the barre is difficult, and while the beginner modifications have you moving with less range - not going as high or as deep - it is a challenging form of exercise. In the end, I would still say that beginners will get more out of this than anyone else, but where barre specifically is concerned, everyone wins. But though this is a low-impact workout in terms of heart rate, the difficulty comes with the fact that barre moves can often be tiny things, like pulsing your leg or squeezing muscles. Vicious, vicious things that, if you have little to no body fat, will get you quick and amazingly sleek results. But without the high-impact cardio, it will do nothing to get body fat off. Your muscles will feel it - ohhh will they feel it - but your heart rate certainly won't. The trampoline takes away a lot of the effort from the jumping, and while guidance is provided for advanced users in both barre and bouncing, the bouncing difference is so weak that it may as well be for beginners. It's true that I'm used to quite intense stuff, but at the same time I know what it's like to be a beginner and in this case, I was approaching the workout from a beginner's point of view, but the fact is that it didn't touch my heart. I was sweating, but it was the barre sequences that earned that. The bouncing 'cardio intervals' were, in all honesty, more like breathers, which is not what a cardio interval is supposed to be. Though I did relish the opportunity to shake out the muscles. If you want to get the most out of the bouncing, you will have to deviate from their instruction and pull upon previous experience and knowledge, replacing basic jumps with tuck jumps and high knees. But this isn't something you should have to do, especially on a DVD that is centred around the use of that very piece of kit, and is ultimately the biggest fault of the DVD. Having previous experience when it comes to form is one thing, but having to provide your own modifications is quite another. Barre is a challenging form of exercise. It burns - there's no two ways about it - and it can create such incredibly sleek legs. There's no arguing this. But it's such a low-impact workout that it does nothing for burning fat. Jump training - plyometrics - is an amazing form of exercise because it requires a lot of power to jump up and land safely over and over again, and becomes even more effective when you become more advanced, moving into squat jumps, tuck jumps, rock stars or burpees. But a trampoline takes away a great deal of the power you need to use in order to make those jumps, thereby removing the effectiveness. The only way to keep jumping effective on a trampoline is to jump high and lift your knees as high as you can with every effort - high knees, tuck jumps and so on are made easier on the trampoline, meaning beginners will have an easier time of them. But even then, it's not what it could be. The merging of the two could be more effective than either on their own, but unfortunately, BarreAmped Bounce provides no suitable instruction on getting the most out of every jump, and the 'advanced' modifications shown, as far as jumping is concerned, is still pretty basic and nothing more is provided. There is little to no cardio involved in this DVD, even in the cardio bounce section. Having said all of this, however, BarreAmped Bounce is very much still BarreAmped, and, let's be honest, jumping on a trampoline is fun. So if you're just looking for more BarreAmped, this is a good addition - but only if you already have a trampoline. 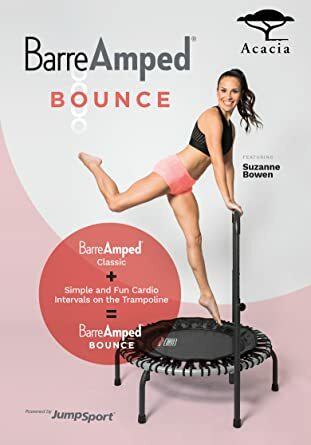 I wouldn't buy a rebounder for this alone, and if you're just looking for BarreAmped with good cardio, definitely go for the suitably named BarreAmped Cardio Burn. With HIIT intervals in a brutal Tabata structure, you do get some damn good cardio in between the typical barre moves. If you did purchase a trampoline or rebounder for the sake of this single DVD, don't panic. I've gathered a few truly effective cardio rebounding workouts from Youtube - including kickboxing - as well as advice on how to get the most out of your rebounder, which will be up soon!